We love an excuse to get out and about and soak up the beauty of the British countryside. We take a look at some of the more quirky British coastal walks to try out this Summer. Watching birdlife fly above the steep cliffs of Bempton or exploring the sea-sculpted caves and arches of Flamborough Head are both excellent experiences, but on the stretch of coast between Staithes and Scarborough, you can see rocks from the Jurassic period (150 – 200 million years old) all along the coast, but a closer examination reveals even greater detail from that era. The fossilised impressions of ammonites and lizards can be found preserved with startling vividness, but there are also the impressions of genuine dinosaur footprints, pressed into the mud millions of years ago and preserved to this day by being baked hard in the tropical heat (yes, Yorkshire once experienced a tropical climate.) It’s astonishing to think of them lasting to this day, and adds a surreal dimension to this already-extraordinary stretch of coast. 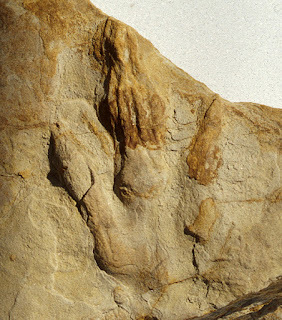 The best places to spot the footprints are Saltwick Bay, Burniston and Scalby Bay. 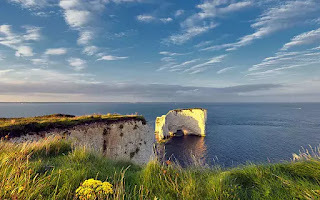 This walk alongside white chalk stacks thought to be named after a local notorious pirate, Harry Paye, is one of the best ways to take in the Jurassic Coast. Alongside the beautiful geological formations, those who visit in spring and summer can expect to see scarlet pimpernels, poppies, sheep's bit and harebells, alongside distinctive pink pyramidal orchids. Chalkhill Blue butterflies can also often be found feeding from yellow kidney vetch flowers, while it is not uncommon to see peregrine falcons hunting for food for their young. Situated on the tip of the Furness Peninsula, Piel Island is a jewel that the traveller can stumble across and be won over forever, by this charming little fifty acre island. For it has a King, a Castle and a Pub, all steeped in history waiting to be discovered. The benevolent King of Piel (who also goes by the name of Steve) also allows visitors to camp anywhere in his kingdom. 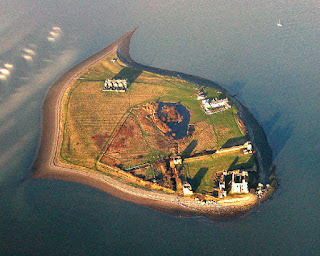 Pitching up next to the island’s 14th century castle with the sea all around, oystercatchers for company and views over the fells of southern Lakeland is an undeniably atmospheric experience. What’s more, visitors can sit in the King’s throne and be bestowed the title of ‘Knight of Piel’. The cost for this honour? The noblest thing a person can do, of course – a round of drinks at the bar. 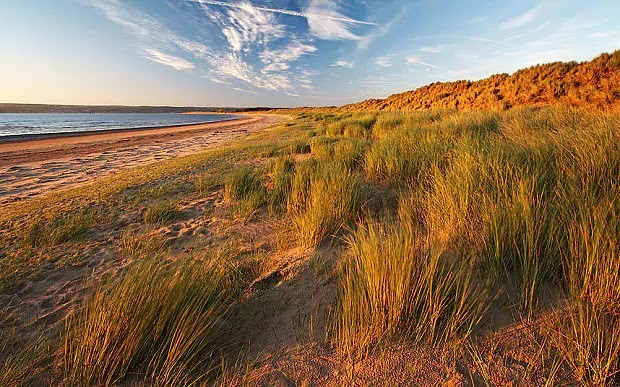 This walk along the Gower Peninsula takes in Whiteford Burrows, the first land acquired by the National Trust in a National Nature Reserve. Highlights of the landscape include corrugated sand dunes and their pate of wispy, grassy hair while the skylarks, common blue butterflies and marsh irises are also a joy. This National Nature Reserve and Special Area of Conservation is also renowned for its sand dune flora and insects, its beach strandline communities, and wading birds. The dunes adjoin the extensive salt marsh of Llanrhidian Marsh and the freshwater marsh of Cwm Ivy Marsh and are still moderately mobile, though the inner system has been planted with conifers. The dune slacks (wet hollows) are particularly rich in flowers and lichens. Ancient Roman poet Virgil once wrote of a place called Ultima Thule, a land in the cold far north believed to be the very end of the known world. Various places have been postulated as the real-life location of this land, including Scandinavia, Orkney and Iceland, but go to Foula, one of Britain’s most remote inhabited islands, and you’d have every reason to believe this was it. People (roughly 30) continue to live and thrive on Foula despite the absence of any pubs, shops, or even trees. On maps, Foula cuts a lonely shape, a single blob of land lying twenty miles west of the Shetland ‘mainland’. Fully exposed to the ravages of the North Atlantic, at its widest Foula is three and a half miles across, but it packs a huge amount of spectacle into its short size. 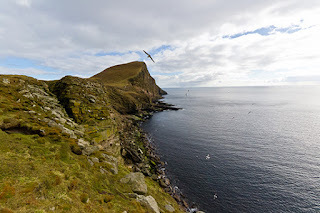 The huge cliff on the back of Da Kame on the island’s west coast towers 366m/1,200 feet above the sea below, making it Britain’s second highest cliff after Connachair on St Kilda, an even more remote archipelago. Da Sneck ida Smaallie is smaller in scale but no less impressive in its own way – a 60 metre-deep, two metre-wide cleft formed when a huge block of sandstone slid away from the cliff face, it’s possible (but not really advisable without a guide) to wiggle down its dank base to emerge at a wild and spectacular storm beach underneath towering, geologically-fascinating cliffs hosting teeming bird colonies. The island is a paradise for birdwatchers and you can expect to see puffins, petrels, divers, glebes, raptors, rails, rakes, gulls and skua (be warned: the skuas in particular can be aggressive in spring, their nesting season.) Never has the end of the world looked so stunning.